Rockville, Md., July 21 – “Accessibility is the nexus of where people with disabilities interface with technology,” said Dana Marlowe, an architect of inclusion and accessibility. 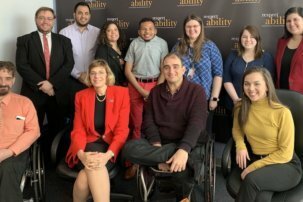 She spoke with the RespectAbility Fellows on July 5, 2017 on the importance of including people with disabilities in technology’s use and development. 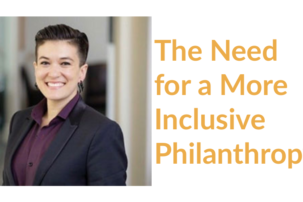 In addition to being a member of the RespectAbility Board of Advisors, Marlowe is the principal partner and co-founder of Accessibility Partners LLC, which is an accessibility advocacy and IT consulting firm. They hire people with disabilities to audit a variety of technology products created by their clients to ensure how usable they are to people with disabilities. It’s a productive cycle that empowers people with disabilities at all levels. Marlowe discussed her Accessibility Partners’ business practices and shared her knowledge of accessibility and assistive technology for people with disabilities. Most of it is first-hand knowledge and scalable. What works for her small business, when replicated, has proven benefits for other workplaces comprised of a majority of people with disabilities. It is because of experts like Marlowe’s firm that big companies’ websites and mobile apps are upholding Internet accessibility standards. 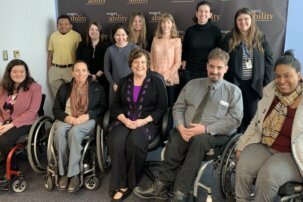 Marlowe educates and assists American companies on accessibility and disability, while also bringing her employees—85 percent of whom have disabilities—to do the work with those companies. Accessibility Partners employs computer engineers in multiple states around the country and has contracts with major Fortune 500 corporations and U.S. government agencies. A large part of what her company does is audit the user interface to assess if a client’s website is compatible with different types of assistive soft and hardware, like text to speech readers for those who are blind, or using multiple modes of input for those with dexterity disabilities. In addition to software compatibility, Marlowe emphasized the importance of technology for people with disabilities. “Technology is a fascinating space, and, if done correctly, can level the playing field for everybody,” Marlowe said. She believes there is great value in an accessible Internet environment for people with disabilities. Marlowe helped me understand that on the web a person can have a disability but present himself or herself however they choose before disclosing their disability. It is the person first, disability second. One of the reasons why the web is so powerful is that it is not immediate disclosure of a disability. This type of freedom online is encouraging and empowering; people with disabilities can use the web to book and plan vacations, pay their bills, apply for jobs and exist on social media without their disability at the forefront of their identity (if they so choose). Marlowe is an amazing resource I wish I had access to many years ago. From her empathetic personal practices to co-founding a business that engineers an inclusive workforce, Marlowe fights for a world that accommodates people with disabilities and facilitates their contributions to society. Marlowe’s expertise has been featured in national and international industry publications and will flourish with the ever changing and growing field of assistive technology pairing with our next devices. No matter what gets developed down the road as we move to an ever shrinking yet connected world, Marlowe will be a megaphone for the voice of users with disabilities. Brilynn Rakes is a Communications Fellow. She is a recent graduate from Fordham University. As a visually-impaired dancer, she was the AT&T Spotlight Performer on ABC’s Dancing with the Stars where she performed alongside Emmy-nominated dancer and choreographer Derek Hough.